Back Row: G.J. Chilcott, A. Adebayo, R.G. Dawe, J.M. Webb, T.Hudson (Asst. Coach), M. Bottomley (Doctor). Middle Row (Standing) P. Bliss (Club Surgeon) J.M. Bardner (Physio) A.O. Lewis (President) A. Robinson, J. Bamsey, N.C. Maslen, N.C. Redman, D.F. Cronin, J.Rowell (Coach) D.W. Egerton, K.W.Withey, P.Pothecary (Baggage Man) M.R.Lee, I Bullerwell (Touch Judge)(partly obscured) D.G. Robson (Asst.Coach) F.A.Howard (Referee) N.Carter (Selector) C.J.High (Touch Judge) C.D.Howard (Hon Sec) R.Seaman (Hon Team Sec). 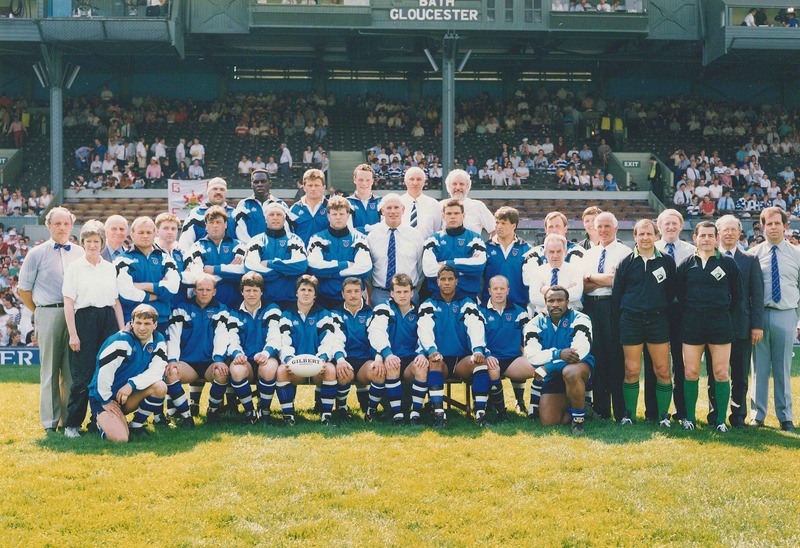 Front Row: A.H.Swift, J.Deane, S.J.Halliday S.Barnes (Captain) S.Knight, J Callard, J.C.Guscott, R.J.Hill, V.E.Obogu.